What do you think about these shoes and the controversy? Are they racist? Are they merely insensitive? My take is I can’t believe someone at Adidas wasn’t smart enough to stop these sneakers before they ever went to marketing and production. Anyone could have seen the possibility of controversy these shoes would cause. The shoes are in poor taste, regardless of what the designer had in mind. Are they racist? Possibly. As a person of the dominant culture I really can’t judge things like that, and it really doesn’t matter if I think they are racist or not. If enough African-American’s say they are racist, I have to take them at their word. 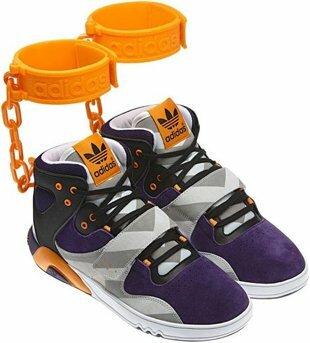 This entry was posted in Racism and tagged Adidas, Adidas Shackle Controversy, African American, images of slavery, Racism, social justice issues, style. Bookmark the permalink. To be honest, racism and slavery didn’t even cross my mind when I saw these shoes. I think a group of people just wanted to make a fuss. I thought they were ugly, but funny. I’m big on talking about current events in the black community and all of that so I don’t take things lightly. If I see racism, I call it out in a quick minute. This? No. This is just silly.